We will visit to the Salt Mines of Maras, also called Salinas de Maras, these salt-mines have been used since the Tahuantinsuyo. The people channel the salt water that bubbles to the surface from a spring called Qoripujio towards men-made wells. From the exposure to the sun, the water evaporates and the salt remains on the surface to be transported later to the market to be sold. The view of this complex of nearly 3000 wells is spectacular. The local people happily demonstrate the ancient techniques to visitors, even allowing them to participate in them. Moray: there are slightly elliptical agricultural terraces, that the people call “muyus”. The largest structure is 45 meters / 148 feet deep, and the average height of each terrace is 2 meters / 3 feet. Many think that this place was an important agricultural experimentation center for the Incas. It has been suggested also that they have a cosmological meaning, but their function, other than agricultural, remains a mystery. Through the use of concentric terraces and because the temperature is different in each of their level, all the ecological tiers found in the confines of the Tahuantinsuyo Empire would have been reproduced in this complex. Full day guided tour to the Sacred Valley of the Incas (Pisac Market and Ollantaytambo) including lunch. You will be driven through a scenic landscape to the Urubamba Valley, the "Sacred Valley of the Incas". Arriving at the town of Pisac, an hour drive from Cusco, you will visit the colorful Pisac Market, where the locals meet to sell their merchandise as they have done it for centuries. There is also a handicraft market. The tour continues to the town of Ollantaytambo from where you will climb up to its imposing Inca fortress at the top of the mountain. Overnight: In Sacred Valley of the Incas. Transfer Sacred Valley hotel – Ollantaytambo Train Station. Departure of your train through an amazing route. Arriving to Machupicchu Pueblo (formerly called Aguas Calientes) Train Station, you will be transported by bus to the top of the mountain (approximately 25minutes ride). Start your guided tour to the hidden gem of the Incas: Machu Picchu Citadel. Machu Picchu Sanctuary is one of the most renowned examples of Inca architecture, surrounded by lush cloud forest. Lost in history, it was not discovered until 1911 by the American explorer Hiram Bingham. You will then have free time to walk around, climb the Wayna Picchu Mountain (if you have previously requested this entrance at the time of the booking; check with your travel advisor), where one can experience spectacular views of all of Machu Picchu, the valleys and mountains that surround it, or visit the Temple of the Moon or the fabulous Inca Bridge. Aboard your train back to Cusco. Transfer train station – hotel. Travel by train with Andean Explorer by Orient Express. This journey includes a gourmet lunch, on board entertainment and afternoon tea. The Andean Explorer has dining cars and a car-bar outdoor observatory. The Andean Explorer is one the most of luxurious and different way of travelling between Cuzco and Lake Titicaca or vice versa. Duration: 10 hours travel time. Note: This train runs only Monday, Wednesday and Saturday; however, from April-October it runs also on Friday. Travel by tourist bus enjoying beautiful landscapes and including four bilingual guided stops on the way: Andahuaylillas – called the Sistine Chapel of the Americas-, Raqchi the God Wiracocha Temple -supreme god of the Incas-, La Raya Pass -the highest point of the trip, to appreciate snow-peaked mountains-, and the Pucara Temple. Duration: 10 hours travel time approximately. Note: This tourist bus runs daily and not only includes entrance fees to all described tourist sites but also a lunch in Sicuani at appropriate time. Travel by plane takes approximately 1 hour and a half or more subject to carrier’s timetable; some may depart in the morning or early afternoon. Overnight: In Puno Titicaca Lake. Transfer hotel – Titicaca Lake main dock. Start a complete day of sailing in Titicaca Lake, the highest navigable lake in the world. Early morning departure for the floating islands of Uros, where the inhabitants still live as they did centuries ago, on floating islands they make with the totora reeds that grow on the lake. Continue sailing towards Taquile Island. This island is a small town inhabited by Quechua speaking natives who have developed both an efficient and original social system as well as a fine hand weaving technique over the generations. After lunch, explore the island and enjoy a beautiful view of Lake Titicaca. Finally, return back to the main dock to take the boat back to Puno. Transfer hotel – Juliacas’s airport. NOTE: depending on your departure time you may add a nice guided tour en route: Sillustani. This complex stands on the shore of Lake Umayo. It is famous for its chullpas, large circular fortified burial towers for the main leaders of the early villages of the Collao plateau. Some are 12 meters high (39 feet), and remarkable for their shape, thinner at the base and wider at the top. Upon arrival, transfer airport - hotel. Colonial, Modern and Contemporary Lima City Tour We will have a panoramic view of Huaca Pucllana, an archaeological precinct build in the IV century A.C., this magnificent ceremonial and administrative centre which was considered by the Incas a holy village. We will continue to the historical centre to learn about its architecture and the urban design of the city, found in old streets filled with colonial houses adorned with Moorish-style balconies. Our trip includes the Paseo de la Republica, San Martin Square and the Main Square, with their different buildings: Government Palace, Archbishop's Palace, the Cathedral and the Municipal Palace. We will enter the monumental Convento de San Francisco (Convent of Saint Francis), which displays the biggest collection of religious art in America, beautiful Moorish arches and its subterranean crypts known as The Catacombs. Finally, we will visit the most traditional residential areas in the capital: The Olive Grove of San Isidro, Miraflores and Larcomar, distinctive tourist centre of contemporary Lima. Transfer to Lima's Airport to take your flight back home or you may add a few more days to your program to visit other wonderful destinations in Peru. 3nights in Cusco City including breakfast, 1night in the Sacred Valley of the Incas including breakfast, 2nights in Puno Lake Titicaca including breakfast, 1night in the Lima including breakfast. 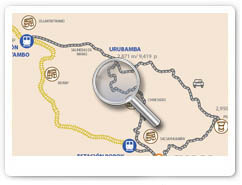 Transfers and Tours with tourist transportation and official drivers as detailed in the program. Train tickets round trip - Entrance fee to Machu Picchu - Round trip bus up/down Machu Picchu Citadel. All entrance fees according to the program. NOTE: Please take into account that we can customize this journey and add tours or destinations according to your expectations and preferences for an absolute once in a lifetime experience. 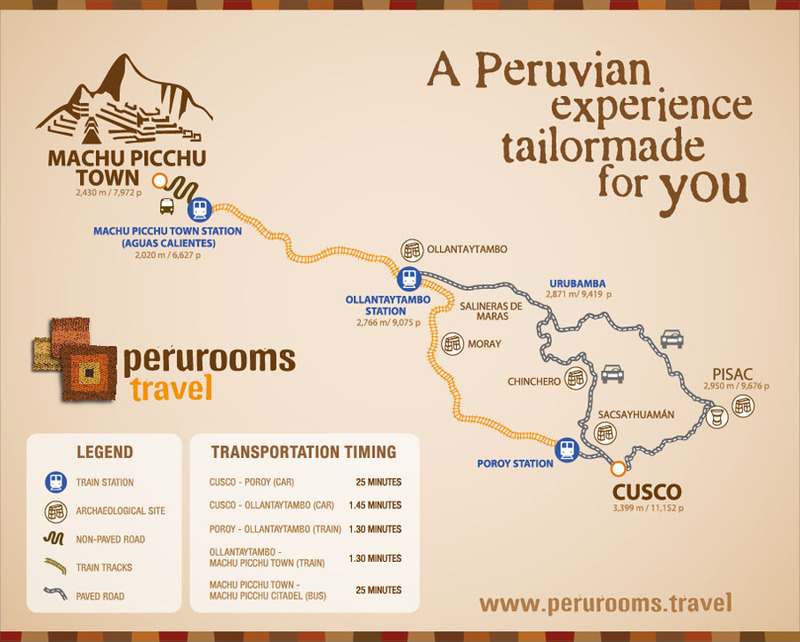 - Travel alternatives in bus, train or plane from Cusco to Puno. - Meals or beverages not specified in the program. - Additional night during the journey due to flight cancellations. - Travel or personal insurance (highly recommended; consult our travel advisors). - Telephone bills, phone calls or messages, laundry expenses, personal expenses and/or extra charges.